Intradine Dip is based on chlorhexidine and cetrimide biosides. Pre- and postmilking teat disinfectant is probably the most important management strategy to reduce the new intramammary infection rate in dairy cows and to maintain a low level of mastitis. Mastitis is an inflammation of the mammary gland. It is generally caused by microorganisms, usually bacteria, that invade the udder, multiply and produce toxins that damage to the mammary gland. Dipping teats of dairy cows before and after milking with Intradin Dip reduce teat skin colonization and contamination with mastitis-causing bacteria and minimize penetration into the teat canal. Many mastitis control experts advocate pre-dipping and is important against mastitis. There is a significant impact on reducing clinical mastitis and somatic cell counts. Teat dips are applied to the teats to kill bacteria that become attached to the teats. It also aids in the removal of small amounts of soil which may be present. Routine post-milking teat disinfection has been, and still is, the single most effective component of hygienic milking programs used in several countries. Post-milking teat disinfection, applied by a spray technique or dipping, as an integral part of their mastitis control programs. Post-milking teat disinfection maintain healthy skin and reduce the bacterial population at the teat orifice and on the areas of teat skin. 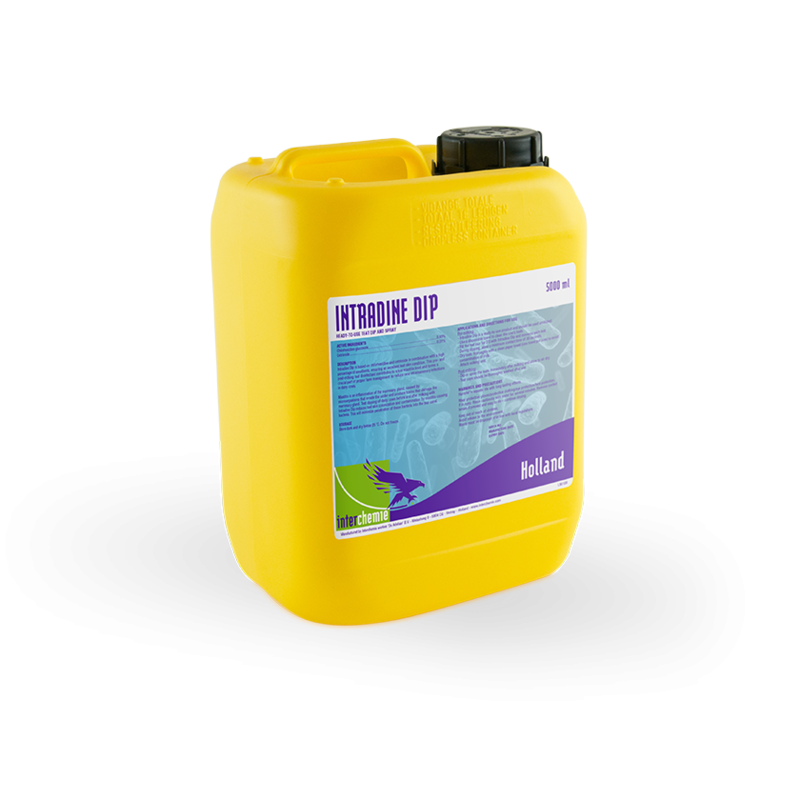 • Intradip is ready to use product and should be used directly from the jerry can without any dilution. • Use disposable towel per cow to clean teat. • Fill teat cup 2/3 with Intradip and immerse each teat. Allow a minimum contact time of 30 seconds. • Refill the teat cup if necessary. • Dry teats thoroughly with a paper towel. Use one towel per cow. • Dip or spray the teats immediately after milking. • Fill teat cup 2/3 with Intradip and immerse each teat or Spray each teat. Allow a minimum contact time of 30 seconds. • Teat cups should be thoroughly washed after use. • Wash and dry udder and teats before the next milking. Wear protective gloves /eye protection. In contact with eyes, rinse continuously with water for several minutes. Remove contact lenses, if present. Continue rinsing.